◆Ultra-Portable delicate design to cover the camera inside, which works like an ordinary alarm clock and absolutely not noticeable. ◆ Multifunctional APP via Wi-Fi streaming connected, After you connect this IP camera to your house WI-FI network, You can see clearly what's going on when you are not home. You could also live-stream your footage from anywhere in the world. ◆ 1080P Full HD, A high-definition image and video quality is crucial to monitoring your home when you are away. Ocaatech hidden camera will catch every detail that you want through the APP. ◆ Night vision & motion detection & alarm push, those functions is the basis for this type of indoor hidden security camera. You can not only see things in the dark but also capture anybody who is moving in the camera. ◆ Ocaatech spy camera can be applied to both battery and USB charging, which is more convenient to be moved to anywhere you want to put,like desk,bookself and closet etc. ☆【Ultra-Portable Design Spy Camera Hidden Camera with 150° Wide Angle Lens for Home Security】:Just a alarm clock? oh no,it is a clock that HD 1080P WiFi camera is hidden in like a spy which will bring you a security assurance by 150°wide angle lens monitoring. you can put this spy camera hidden IP camera on the desk or bookshelf and it is totally not noticeable while the spy camera is recording. ☆【APP & Wi-Fi connected Via IOS/ Android】: Get this spy camera, live-stream your footage from anywhere in the world won't be a problem, this wireless Wi-Fi spy camera hidden in clock can be easy to connected to internet network via IOS/ Android APP, just download the corresponding app and follow the instruction book, then everthing you monitored will emerge on your phone,tablet or computer. ☆【24/12-hours system for Motion Detection & Night Vision & Alarm Push Surveillance Camera】: This spy mini surveillance camera alarm clock built-in 12 night vision IR, any suspicious faces and details can be see clearly even in a very dark environment. Day or night, you'll know exactly who's coming into your house or office when you're not around. Alarm notifications will be pushed to your cell phone once the motion is activated, and will snapshot photos on APP. ☆【HD 1080P Video & Multifunction APP Mini IP Camera Remote Video Recorder】: This smart alarm nanny camera clock with Crystal clear HD 1080P video 150 degree wide angle lens, 4x digital zoom HD displays with H.264 compression. Support all time recording, alarm recording, time recording on micro SD card; Snapshot, adjust resolution (1080P, 720P, 640P),Left/Right/Up/Down Reversal, Contrast/Brightness, Alarm setting, Looping Recording, Sync with App Time. Monitoring your house 24/7. 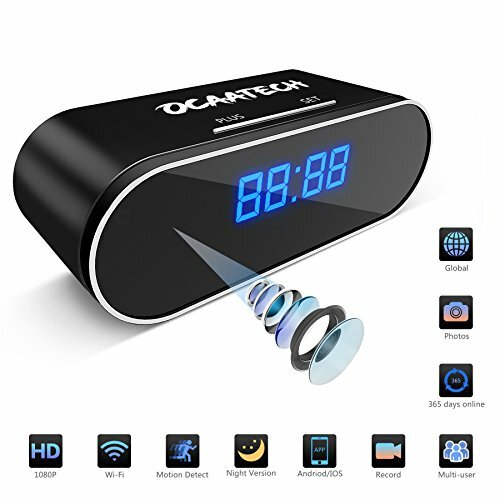 ☆【100% Quality & Service Guaranteed】:You cannot imagine that how a convenient & safe life will OcaatechWi-Fi Mini Spy IP Camera Alarm clock bring to you，there is no doubt to get one for try. and you have our word to get money back or return for a new brand one whatever problems you encountered, just please feel free to contact us-24 hours response after-sale service(our Email:tianjinc13@163.com), we will make things right for you. If you have any questions about this product by Ocaatech, contact us by completing and submitting the form below. If you are looking for a specif part number, please include it with your message.